Have you ever thought that why is my site not receiving more traffic?, and not ranking on the first page of search engines? Driving traffic to your website requires hard work, and with due competition, it is more like dying to bring up the number of visitors. Every site out there, most of the time, rely on search engines for increasing website traffic. The visitor who comes to search engine for specific information never go beyond the first page of search results, so your website needs to be on the first page of any search engine to increase your traffic as well as to rank above your competitors. Social sites are now the best way to drive traffic as you need not worry about SEO. In this case, you need to work on finding keywords that your competitors use to crush them and boost the traffic to your website. It is challenging for someone like you, who barely get time (of course you may be busy in writing high-quality contents) will need some tool to do this work. So in this post, I am going to share you one of the tools which help you in beating the competitors by finding their best-performing keywords, backlinks, user experience, position analysis, and much more. 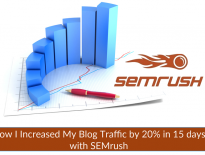 SEMrush is a favorite SEO tool used by top bloggers and website owners. SEMrush has a large collection of data, about 120 million plus keywords and 128 million plus domain information on organic search positions, search volumes, CPC, Domain URL and traffic a website gets, powered by its 30 databases. Still not convincing, let’s check out how SEMrush can help you beat your competitor by finding the best performing keywords. You can perform some basic search operations to find top keywords, Search volumes, CPC and much more without signing up for SEMrush. However, to export reports and other advanced features like historical data requires SEMrush account. Start your free trial of SEMrush now. Enter your competitor’s domain name in the below search bar or on the SEMRush portal. In my case, I am entering the domain name of my favorite blogging site “shoutmeloud.com“. You will get a domain overview page where you get details of Organic search traffic, Top organic keywords, Competitors, Backlinks, Advertising, Paid search, and more. The above page is the analysis page of your competitor’s domain. Continue further to know how to rank above your competitor. Finding top performing keyword is the most useful feature in SEMrush, and it is very much required to beat competitors as it reveals which keyword brings them the most traffic. On the domain overview page, click on “View full report“ in the section”TOP ORGANIC KEYWORDS” to get top keywords that are sending tons of organic search engine traffic to your competitor website along with their corresponding landing (URL) page. The keyword that tops the chart brings most of the search engine traffic to the competitor site. Focus on the top keywords and work on it. Keyword – Organic keyword that brings traffic from search engines. Position – The position the domain gets in organic search for the given keyword. Keyword Difficulty – Tells how difficult it would be to rank well in organic search results. The higher the value, the harder it is to achieve high rankings for the given keyword. Volume – Number of users have searched for that keyword in a month. CPC – Average cost per click for the given keyword. URL – Corresponding landing page to which the given keyword is driving traffic. Traffic % – Percentage of estimated traffic brought by that keyword from a particular geographic location. You can also change the geographic location using the country selector, located just below to domain search. Geolocation selector could be useful for improving the local search traffic and search engine rankings. Competitive Density – This tells density of advertisers competing for that keyword in Google-Adwords. Higher the number, the greater competition, means you need to bid high in Google-Adwords for advertisement. Results – Number of URL’s shown in search result page for that keyword. Lower is better, here. Trend – Search trend for that keyword. Choose the keyword that trends most of the time in the last 12 month. I hope, by now. You got a clear idea of how much search traffic your competitor websites are getting from specific keywords. You may be thinking this is funny! Do you know? All business faces competition, and internet is not an exception. To stay in particular business, you must know whom you are competing and what is their strength and weakness. With SEMrush you can easily find your competitors, this will help you focus on them and work towards their top performing keywords. Enter your website URL on the below search bar to get a list of your competitors. Below are my competitor’s – For ITzGeek.com. On the domain overview page, click on “View full report“ in the section”MAIN ORGANIC COMPETITORS” to get a full report of your website competitors. Clicking on the domain will take you to the overview of your competitor domain where you can get their top performing keywords, landing pages and more. You can also export the data in to excel by clicking on the Export button located at the top right corner. Domain – Your competitor’s domain name. Competition Level – How difficult it is to compete with them. Common Keywords – Common keywords between your website and your competitor website. Click on the number to get common keywords. SE Keywords – Number of keywords bringing users to the competitor website. Click on the number to get all keywords for your competitor website. SE Traffic – Traffic brought to the website via Google search. Want to understand where your competitors are building their backlinks, including do-follow links. Just enter their domain name in SEMrush and get a list of all backlinks it has. 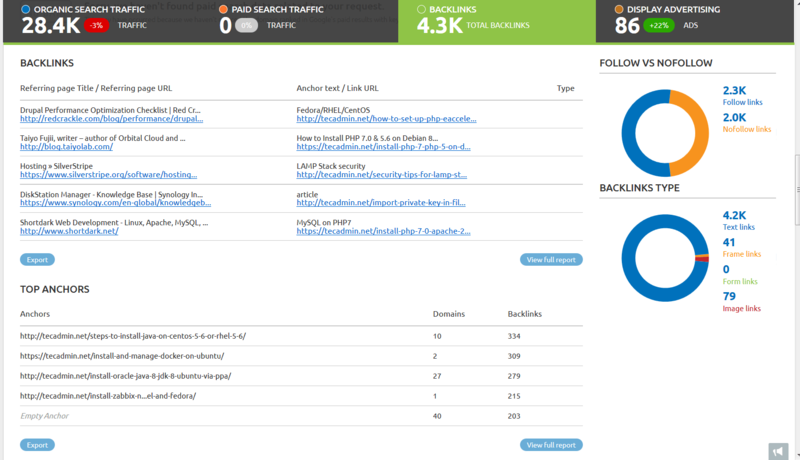 SEMrush makes it easy for finding out all the backlink count with the pie-chart, also you can export a detailed backlink report for any domain along with their Anchor text. As part of backlink analysis, there is one more report which gives you how much total number of backlink a website has including the referring domain. This report will help you building backlink opportunities with the referrer domain of your competitor by creating partnership over email outreach or blogger outreach. To improve the rank and search engine traffic, you need backlinks. Link building the effective strategy for any website to rank higher in Google search results. All features coming up requires the SEMrush subscription. Signup today and get 14 days free trial. Have Panda or Penguin update hit your site? Want to recover your website from Google update? SEMrush will help you find all the issues your site has, and you can fix those problems to perform better in Google search results. Writing and posting high-quality content will not merely increase the traffic. Search engines will look for error free pages when it crawls the pages. Errors could be Broken links, Missing title tags, Status codes(5xx,4xx), needs and more. Go to Projects –> Create my first project –> Enter a root domain and Name of your project. Start site audit using sitemap file. Below image shows the audit results of my website. 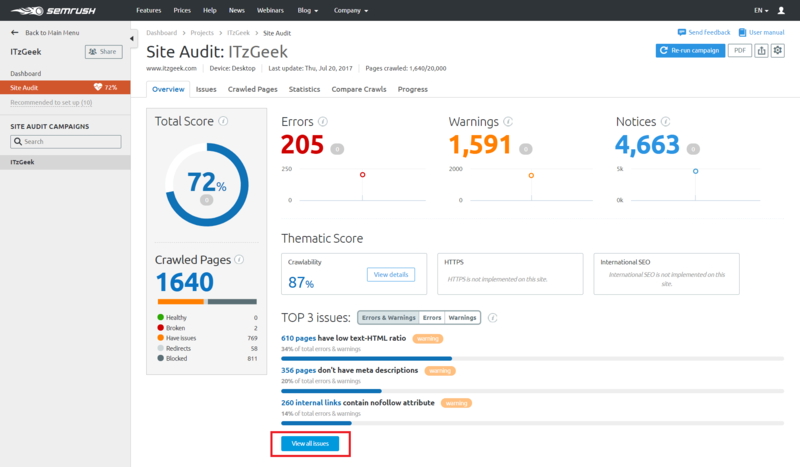 The audit report has errors and warnings for me, and I need to work on those to improve the search engine ranking. With this feature, you can find high CPC (Cost Per Clik) and trending keywords using SEMrush. Using these profitable keywords, you will not only increase the traffic to your website, but it will also increase your advertising earnings as well. Enter any keyword in below SEMrush search box or SEMrush portal to begin. SEMrush will give you a report with a monthly search volume of that keyword along with related keywords. So, you can create an article on your website using the keyword that trends most of the time to improve the traffic. Choose the less competitive keyword with more search volumes so that your website can rank easily over other competitors for that keyword. With SEMrush, you can track the rankings of keyword daily basis on Google, Bing, and Yahoo. It is also possible to track keyword rankings specific to region and devices. Go to Projects –> Select Project (ITzGeek) –> Position tracking. Domain Settings – Choose which domain you want to track like root domain or subdomain or subfolder or URL. I am tracking root domain here, which is www.itzgeek.com. Device and Location – Set the location (United States), language (English), and device (desktop or phone or tablet). Competitors – SEMrush will automatically populate your competitors, so choose them or type your competitor’s domain name manually. Keywords – Add keywords you want to track. Click on Start Tracking to complete the tracking configuration. You will also get a weekly report of keyword position. SEMrush comes with three plans namely Pro, Guru, and Business account. 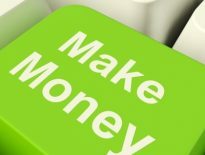 SEMrush pricing starts from $99.95 (SEMrush Pro), Guru account ($199.95) and Business account ($399.95). Below image shows you the comparison of these three plans. You can save up to $1100 with an annual plan. SEMrush is used by over millions of users which strongly tells you how popular and trusted it is. Whether you are seeking to increase search ranking or improve your earnings by promotional products, SEMrush is the best tool to beat your competitor by choosing the best keywords. With SEMrush you can keep an eye on your competitor’s keywords and create a backlink opportunities with similar minded people to increase your overall traffic and website ranking. In my starting stage, my focus was only on writing quality contents hoping that my site will flood with much traffic, but no such thing happened. I was disappointed, then with SEMrush tool, I started to focus writing the content based on my competitor’s keyword. Soon after, I have begun to see the improvement in overall traffic to my website. Don’t wait, try SEMrush today. You will not regret.